Many think that e-commerce in Vietnam is a “sleeping lion”, at the same time projecting a "big 2015" when the market value is expected to skyrockets to almost 5 billion USD a year. Is this going to happen or just a myth? Many think that e-commerce in Vietnam is a “sleeping lion”, at the same time projecting a "big 2015" when the market value is expected to skyrockets to almost 5 billion USD a year. Is this going to happen or just a myth? Let's look at some market analysis to understand the e-commerce potential of Vietnam. In contrary to brick and mortar, e-commerce market potential relies heavily on one factor - Internet connectivity. The more Internet users in a country, the better potential for e-commerce growth. 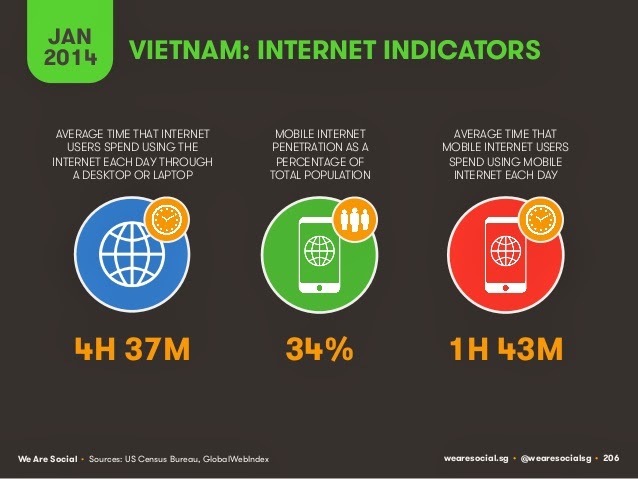 If you refer to the visualizations above, you can observe that total Internet users in Vietnam has soared 153% from 28 million to 43 million, in a span of just 5 years. In comparison, Malaysia Internet users is expected to grow 123% from 2011 to 2016. 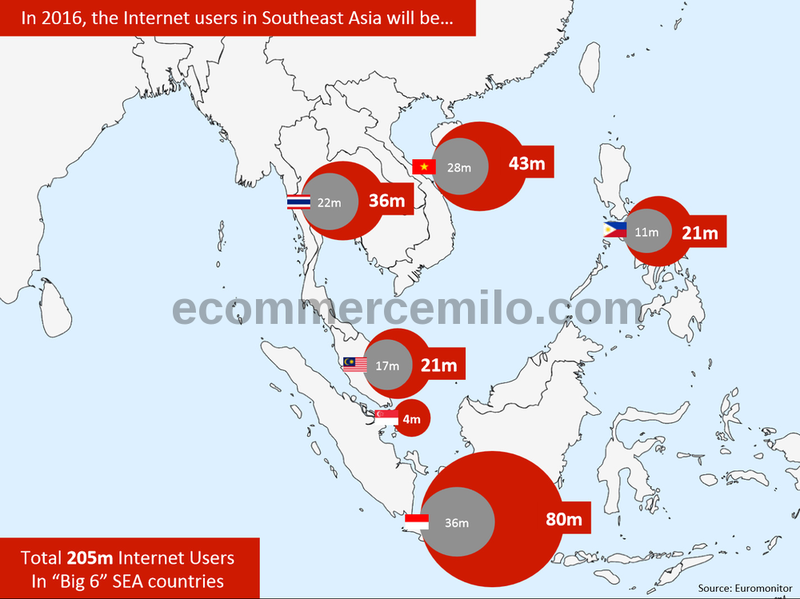 This also implies that e-commerce market size will grow tremendously in Southeast Asia. ECP is an important measurement of e-commerce market maturity in the country. In short, it is a percentage of total retail market being done online. Let's take a look on ECP of each market in Southeast Asia including Vietnam. In 2011, Vietnam's ECP was only 0.25% and valued at 154 million USD. However by the end of 2016, ECP in Vietnam is expected to triple to 0.71% while online retail will increase 6 folds to 900 million USD (nearly 19,000B VND). Like any other countries, the increase of ECP is contributed by top local etailers. Nguyen Kim is projecting their online sales volume to reach 10 million USD by 2014. Thegioididong.com is planning to reach 50 million USD and the newly-born FPTShop is said to grab 25 million USD in online sales. Besides that, there are a number of C2C players in Vietnam. Sendo.vn has just recently announced their aim to become number 1 in marketplace. Their Gross Merchandise Value (GMV) is expected to reach 25 million USD by the end of 2014. Other than that, 123mua.vn of VNG is refining their operation to reclaim the market share they lost, project LANA is reaching the end of their trimming and restructuring process to be fitter and grow faster in a very near future. By just looking at the current players, without considering the entry of other big contenders like VinEcom and Cdiscounts, Vietnam e-commerce should be flourishing in the upcoming years. Let's expect big battle among the e-commerce players and many record-breaking events in both business and technology aspects. In Jan 2014, We are Social has released "2014 Asia-Pacific Digital Overview" on worldwide connectivity through various means and devices. 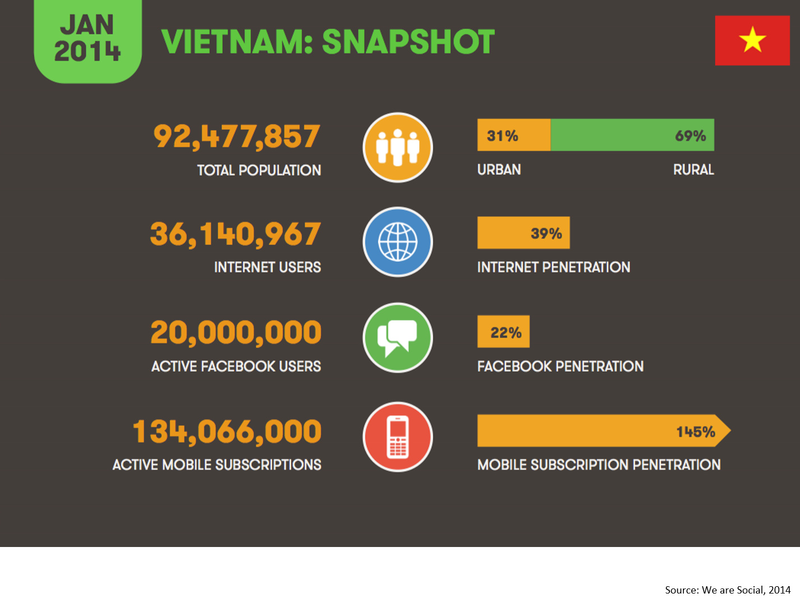 Out of 92 million of Vietnam population, 36 million (or 39% of total population) are Internet users. More than half of the Internet users (20 million) have Facebook accounts, and in average every Vietnamese have 1.45 SIM card (mobile subscription). 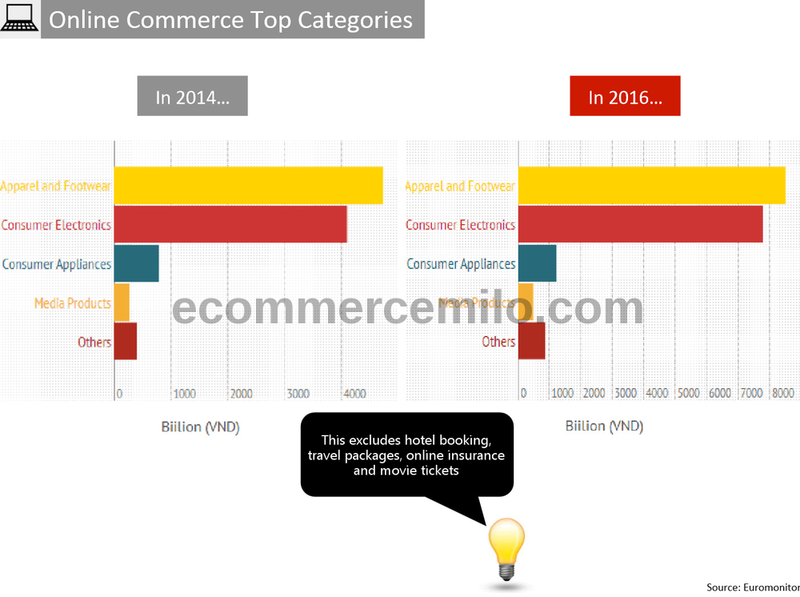 With huge connectivity especially with 43 million of Internet users by 2016, expect e-commerce to boom in the next 3 years. The speculation earlier on “big 2015” is definitely not a myth. 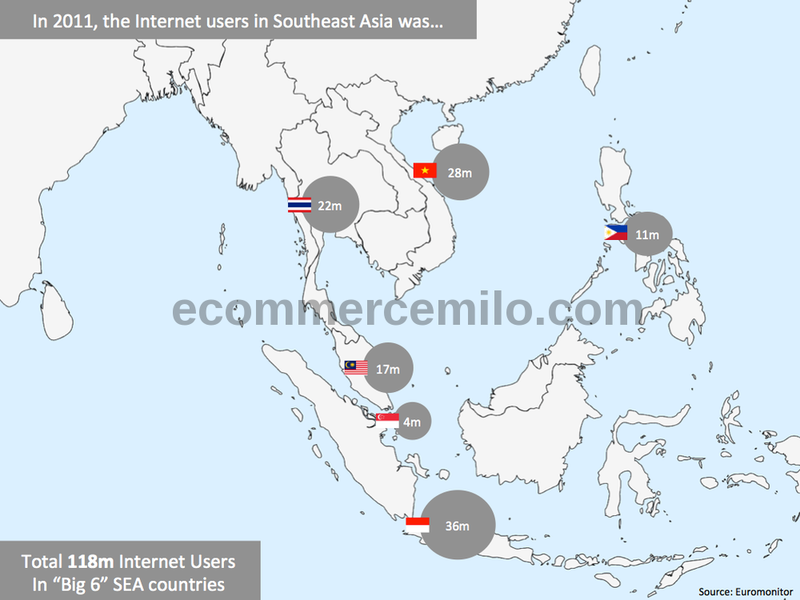 The potential is definite, but what should you sell if you venture into e-commerce in Vietnam? There isn't any sure answer to this but let's refer to some data sources on top online categories. 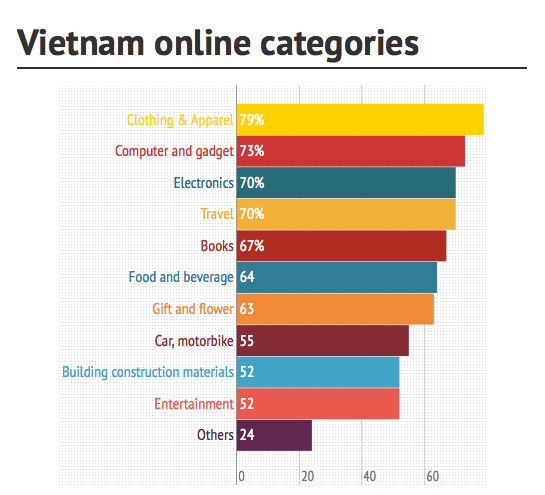 According to the charts above, the top 2 e-commerce categories in Vietnam are Fashion (apparel, footwear) and Electronics (mobile phone, tablet, laptop), which covers more than 50% online sales volume. According to Euromonitor, the sales volume of the top two categories will double by end of 2016. 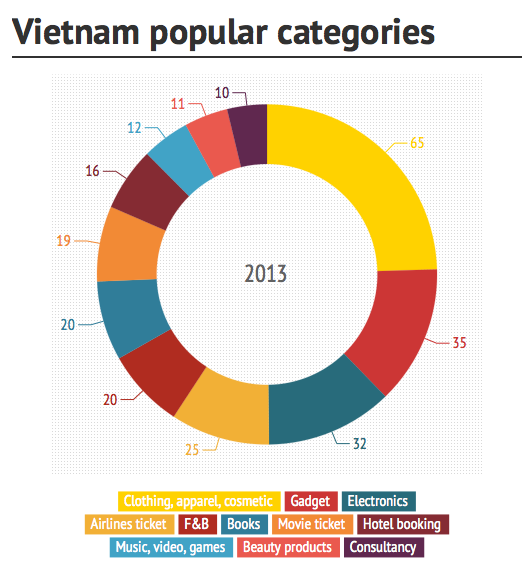 While e-commerce in Vietnam is still in nurturing phase until 2015, will it "skip" the PCs and go direct to mobile? 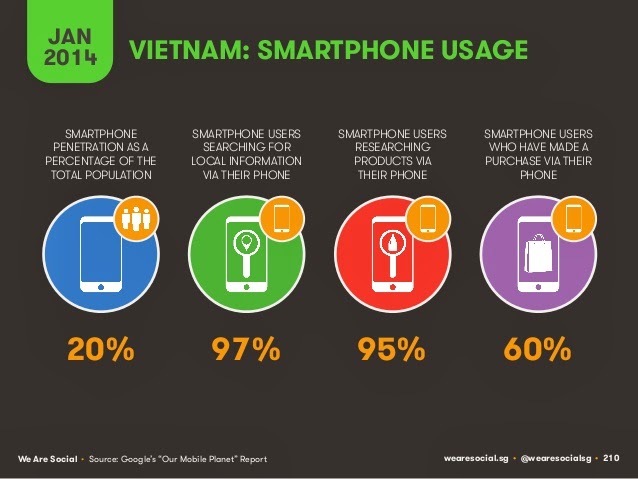 Let's take a look at some fundamental data on mobile landscape in Vietnam. In January 2014, 34% of the population in Vietnam has access to Internet on their mobile devices, which also represents 90% of the total Internet users. The average online time via mobile devices is 30% of the total online time which also includes desktop, laptop and other devices. Around 20% of Vietnam population are carrying smartphones with 95% of smartphone users research products via their phone, and 60% them have made purchase via their phone. In conclusion, e-commerce will only blossom in Vietnam (in fact in most places of the world) and we are expecting more big players like Cdiscounts, Rakuten, and VinEcom coming into the picture. E-Commerce on mobile: classified, C2C marketplace, old stuff for bargain etc. Service to support e-commerce: payment gateway (especially for mobile), delivery, integration solution etc. “Smart” product to understand users: data mining & business intelligence, social listening, social ID analysis, buying pattern research etc. Online product to support merchants: shopping cart, online POS, cloud inventory control service etc. Here, we wish you success on your e-commerce venture to Vietnam! If you are unable to view the slides below, you can view it here.